The Sandstone gold project comprises two granted Mining Leases on which the processing plant is situated. 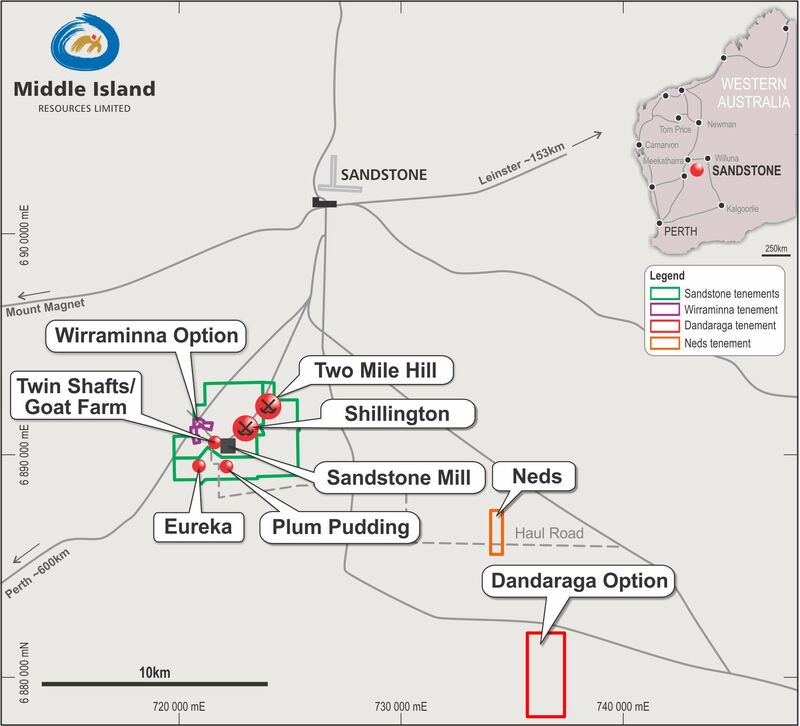 Middle Island also has option-to-purchase agreements covering a 100% interest in the adjacent Wirraminna and proximal Dandaraga gold projects, and has acquired a 100% interest in the nearby Ned’s Project and successfully applied for a 100% interest in the Jew Well Exploration Licence. Middle Island has, or has the rights to, a 100% interest in mineral tenure comprising some 191km2. The Sandstone project also includes a 600,000tpa CIL processing plant, all associated infrastructure, an operating licence, permitted tailings storage facility and bore field, and three fully equipped camps located on freehold title within the nearby village of Sandstone (click on the Open Map tab to view tenement locations). In excess of 1Moz of gold has been produced from surface, open pit and underground operations in the Sandstone area since the 1890’s. In addition to historic mining activities, more recent gold production is variously attributed to Herald Resources Limited in the 1990’s and Troy Resources Limited (Troy) from 1999 to 2010. Troy extracted and processed a combined total of approximately 4.4Mt open pit of ore at an average grade of 3.6g/t Au for production of 508,000oz gold before the operation was placed on care and maintenance in September 2010. 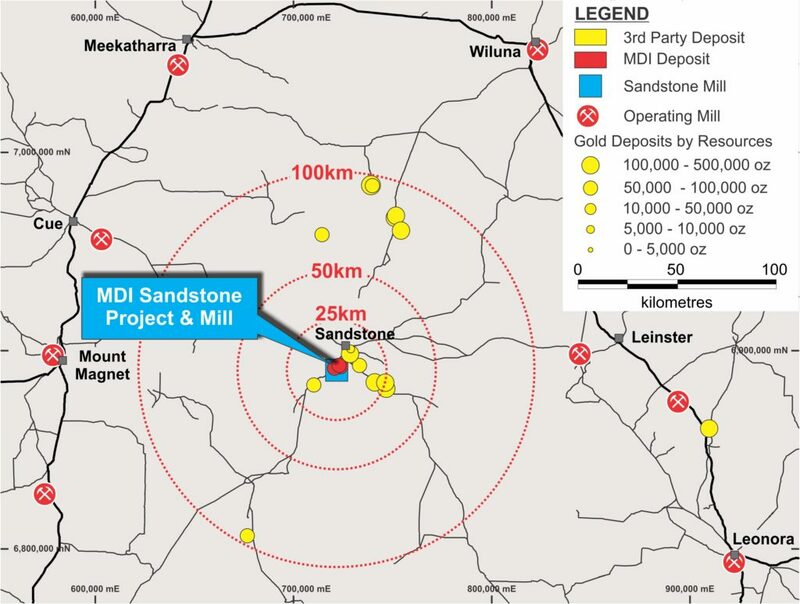 Southern Cross Gold Limited (SXG) acquired the Sandstone project from Troy in December 2012 with the primary objective of relocating the processing plant to its Marda Project some 100km to the south. A subsequent merger of SXG and Poly Metals to form Black Oak Minerals Limited (Black Oak) diverted focus to Poly Metals’ NSW assets before being placed into administration in September 2015 and subsequently liquidation in February 2016. Middle Island acquired a 100% interest in the Sandstone Project from the Receivers of Black Oak in July 2016 for a consideration of A$2.5M, comprising a A$250,000 deposit, a A$1.25M completion payment, a A$500,000 deferred payment (paid in December 2017), and a A$500,000 payment contingent on recommissioning of the processing plant. Gold mineralisation is hosted within the Sandstone greenstone belt (Figure 1) within the Southern Cross Province that forms the central spine of the Archaean Yilgarn Block. The Sandstone greenstone belt forms a classic ‘hourglass’ structure at the northern end of the Diemals Dome, where two major trans-current structures, the Edale and Youanmi faults, respectively confine the eastern and western margins of the belt. The updated Resource Statement is included in the table below. These Indicated and Inferred Resources, comprise an aggregate of 12.7Mt at 1.4g/t Au for 537,000ozs of gold are estimated by recognised independent industry consultants. 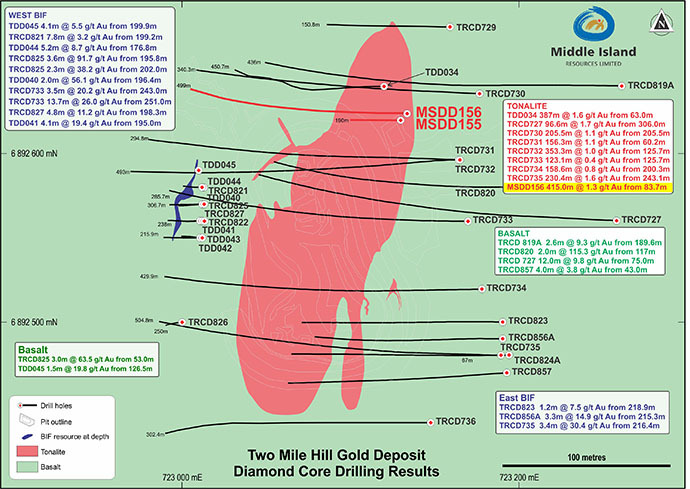 In addition, an Exploration Target of 24Mt to 34Mt at 1.1g/t to 1.4g/t Au has been estimated for the Two Mile Hill tonalite deeps deposit, representing an additional 0.9Moz to 1.5Moz of contained gold. The Company is progressively upgrading and expanding the JORC 2004 resources to JORC 2012 standard and continuing to make new gold discoveries. Since acquiring the Sandstone Project in 2016, Middle Island has been undertaking verification, infill and extension drilling programmes to progressively add Mineral Resources and upgrade previous Mineral Resource classifications into compliance with the 2012 Edition of the JORC Code. Middle Island Resources Limited has a firm policy to only utilise the services of external independent consultants to estimate Mineral Resources. The Company also has established practices and procedures to monitor the quality of data applied in Mineral Resource estimation, and to commission and oversee the work undertaken by external independent consultants. In all cases Mineral Resources are estimated and reported in accordance with the ‘Australasian Code for Reporting of Exploration Results, Mineral Resources and Ore Reserves’ (the JORC Code). Mineral Resources reported in accordance with the 2004 Edition of the JORC Code were prepared by Snowden Mining Industry Consultants on behalf of Troy Resources NL, and are reported in the Troy Resources NL 2011 Annual Report. Mineral Resources reported in accordance with the 2012 Edition were prepared by Mr Brett Gossage of EGRM Consulting Pty Ltd and Mr Shaun Searle of Ashmore Advisory Pty Ltd on behalf of Middle Island Resources Limited. The Competent Persons in each case are Members of the Australasian Institute of Mining and Metallurgy (AusIMM) and qualify as a Competent Persons as defined in the JORC Code. The processing plant was constructed in 1994 with a capacity of 250,000tpa and upgraded to 600,000tpa facility by Troy in 1999 (Figure 2). Troy operated the plant from 1999 to 2010, processing a total of 4.4Mt of ore to produce ~508,000 ounces of gold at an average grade of 3.6g/t Au. The plant was placed on care and maintenance in September 2010 and has not operated since. The plant has a conventional grinding and milling circuit and carbon-in-pulp (CIP) leach circuit. It is in a reasonable condition, with refurbishment and upgrade costs of A$8.05M estimated by a recognised independent process engineering firm in late 2016, plus estimated owner’s costs of a further A$1.28M. The processing plant is supported by a contracted diesel-generated power plant, fuel tanks, all associated workshops and offices, and a substantial inventory of equipment and spares (Figure 3). The current permitted in-pit tailings facility has approximately 6 months’ capacity which, along with a permitted bore field, lies proximal to the processing plant. A 57-person owner’s camp, a 36-person contractor’s camp, and an 8-person exploration camp and core farm are all located on freehold titles within the village of Sandstone, 12km north of the plant. 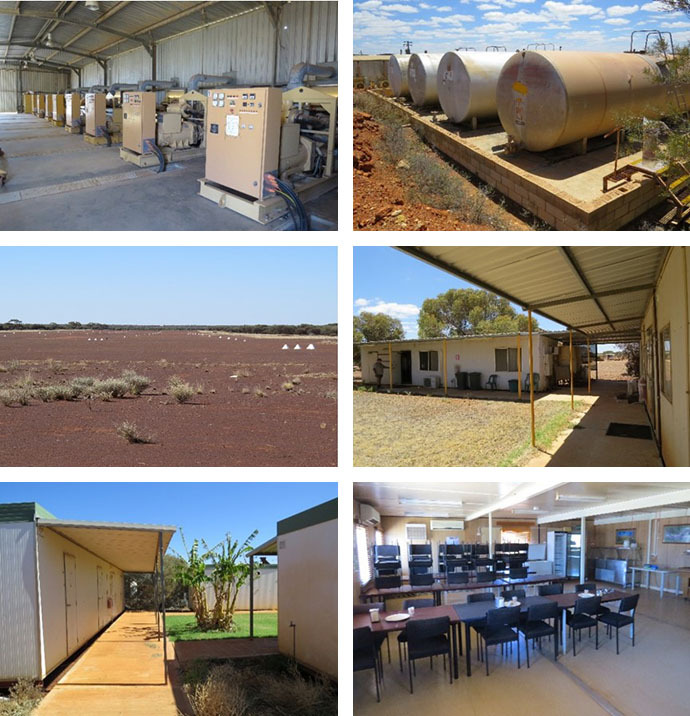 Sandstone also has a well-maintained airport capable of servicing FIFO operations. 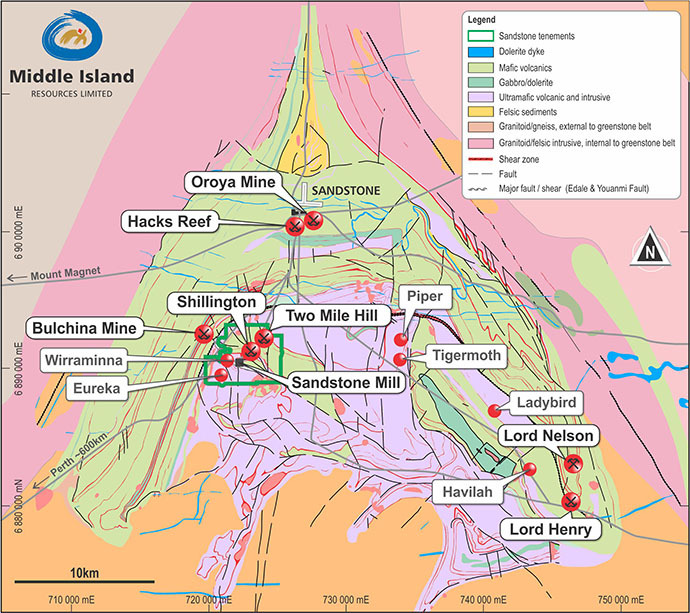 The Two Mile Hill tonalite comprises a ubiquitously altered and intensely stockwork veined, intrusive stock or plug that at surface measures 250m long, 80-90m wide and extends to at least 700m depth (Figure 4). 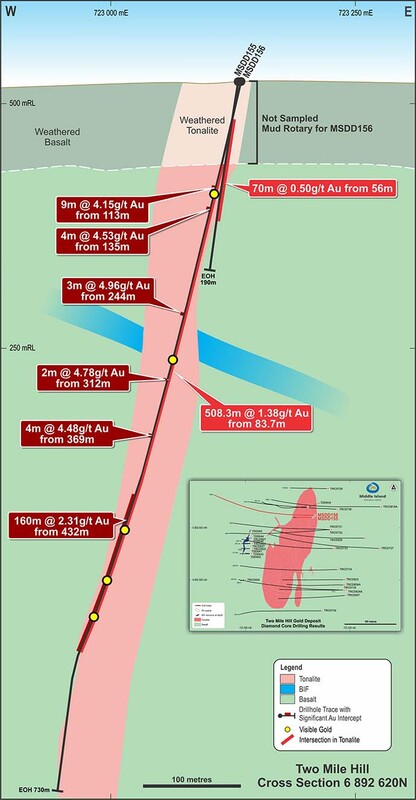 This target includes drill intercepts of 508.3m at 1.38g/t, 141m at 2.30g/t, 353.3m at 1.04g/t and 156.3m at 1.14g/t Au, as shown in Figure 5 below. Metallurgical testwork identifies that gravity gold recoveries of >58% can be anticipated prior to leaching. The overall gold recoveries range from 93% to 97%, with ~90% leach extraction being achieved within just two hours following gravity gold recovery. A moderate Bond work index of 16.4kWh/t, low reagent consumptions and no deleterious elements indicates that the material is metallurgically consistent with the Company’s Sandstone processing plant. Recent mineralogical testwork indicates that in excess of 99% of the gold is hosted by the quartz veins, with quartz vein composite samples averaging 34.8g/t Au, while tonalite-only composites averaged 0.15g/t Au. Ore sorting trials indicate that up to a 257% increase in grade may be achieved at gold recoveries in excess of 93%, and that up to 64% of the sorter feed material may be rejected delivering significant economic benefits to bulk underground mining of the tonalite deeps deposit. 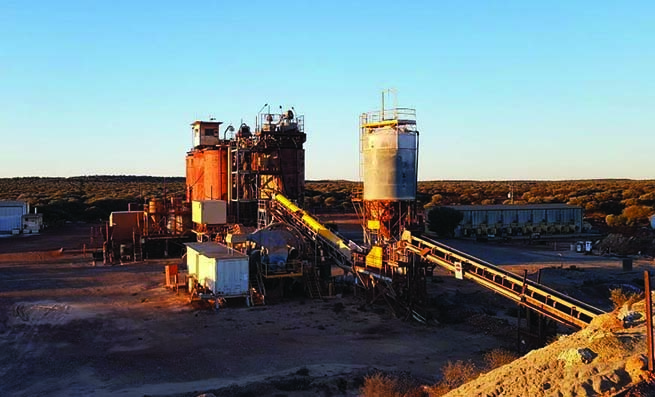 Despite the substantial scale of the Two Mile Hill tonalite deposit, the ore sorting concept could prove more compatible with the milling capacity of the Sandstone processing plant. A banded iron formation (BIF), which obliquely intersects and is intruded by the Two Mile Hill tonalite at depth, is also very strongly mineralised. Drilling within the BIF adjacent to the tonalite includes intercepts (essentially true widths) of 8.5m at 49g/t, 13.7m at 26g/t, 4.5m at 25g/t and 3.5m at 20g/t Au at a depth of some 200m below surface, as shown in Figure 6 below. Extensions and repetitions of this significant style of mineralisation remain to be fully defined and tested around the margins of the tonalite intrusive, and a further two BIF units have been identified by drilling and geophysics at deeper levels adjacent to the tonalite. A series of significant greenfields targets have also been identified elsewhere within the project that require systematic exploration, and some 30 new targets have been generated by a ‘weights of evidence’ targeting study. Following infill drilling and a resource upgrade of the Two Mile Hill and Shillington open pit deposits in late 2016, a pre-feasibility study (PFS) was undertaken to assess the potential to recommission the Sandstone operation on the back of a modest initial gold inventory that could then be extended and enhanced via exploration post-commissioning. The PFS concluded that, while successful on an operational basis, the economics were insufficient to support the capital required to recommission the project on the basis of the Two Mile Hill and Shillington open pit deposits in isolation. As such, the Company continues to progress a dual-faceted strategy to extend and enhance the production profile in the first instance, and/or consolidate proximal third party deposits within the district in the second instance, triggering a recommissioning decision in the shortest possible timeframe. 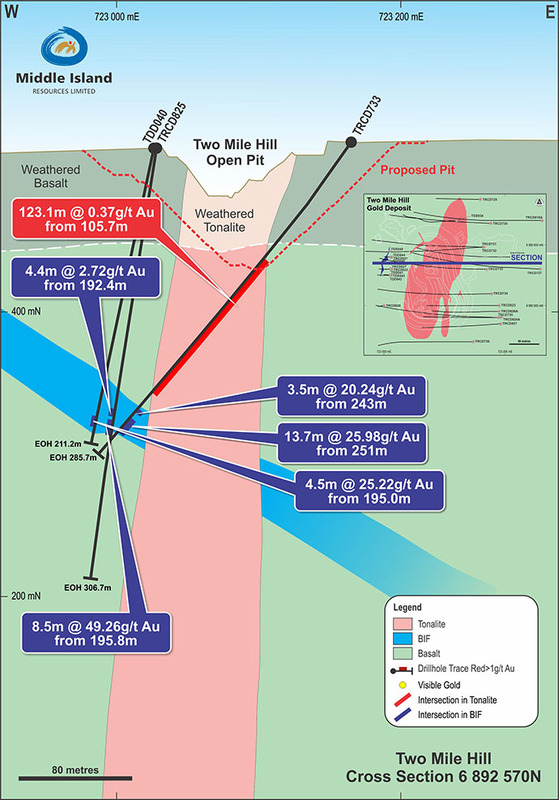 Brief summary of the Sandstone Gold Project.